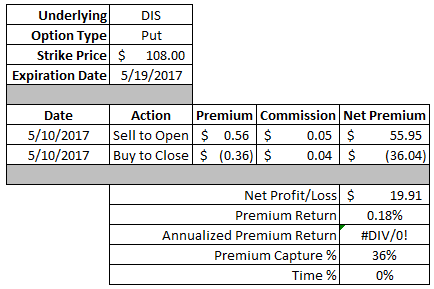 The last 1.5 months have been going well for my options trading. While last week saw a bit of a step back in terms of realized profits it was still a profitable week and there were plenty of new positions put on that should deliver profits down the line. In Monday's post I covered all of the new or rolled positions and today I'll cover all of the closed positions from the week of May 8th. The original put option was part of an earnings play on Starbucks that didn't quite go as planned. However, everything worked out in the end as I was able to roll the position forward a couple weeks, pick up some extra premium in the process and still close the position out for a solid profit. This put option generated net profits of $89.82. Based on the $6,000 of capital securing the contract that's a solid 1.50% return in about 1.5 weeks. The annualized return works out to a solid 57.2%. I was able to capture 78% of the maximum potential profit in 55% of the days until expiration. EOG Resources isn't a company that's heavily followed in the DGI space and for pretty good reason. That had put together a string of consecutive increases, but have kept the dividend at $0.1675 since their October 2014 payout. Since I own a small bit of EOG, it was actually the first company I invested in, I still keep track of how things are going. 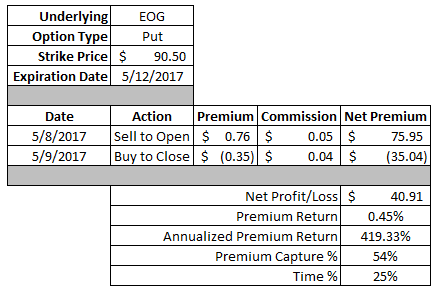 This was purely an attempt to make a quick buck on EOG as the earnings release meant higher option premiums. 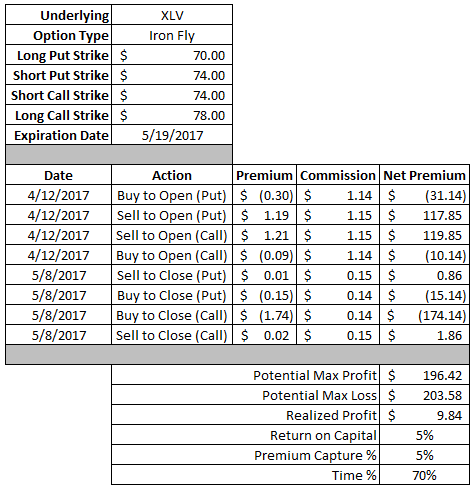 Things were looking a bit hairy there for a while, but as the day went on the share price climbed higher, implied volatility was sucked out of the prices and I was able to close out the position for a great 1 day profit. This earnings play produced net profits of $40.91. Since there was $9,050 in capital "at risk" that works out to a 0.45% return. However, the annualized return looks fantastic at 419.3% since it was earned in just 1 day. I was able to secure 54% of the maximum profit potential in 25% of the days until expiration thanks to the post earnings release volatility crush. Micron isn't exactly a company that I want to build up as part of my core portfolio; however, I also believe the business trends for Micron are good and the the implied volatility in the options can make for really good returns. This put option generated net profits of $49.91. That's a solid 1.85% return on the $2,700 of capital securing the contract. The annualized return on this trade was stellar too at 130.8% although that was largely a function of the holding period being just over a week long. 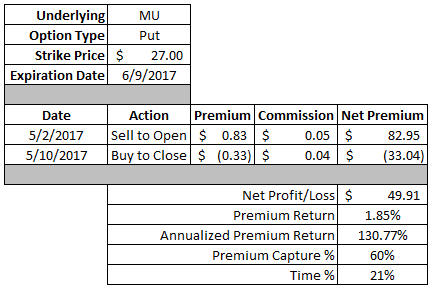 I was able to capture 60% of the maximum profit in 21% of the days until expiration. Similar to the Micron Technology put option this isn't exactly a company that I want to own long term. However, if I see an opportunity I want to take advantage of it and that's just what happened here. 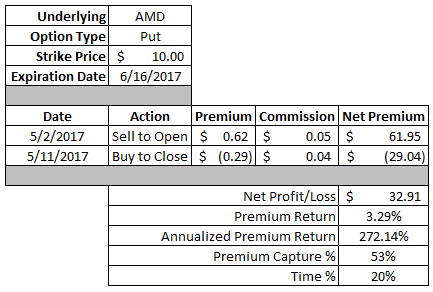 AMD's share price sold off around 25% when they released earnings so I took a bit of a contrarian stance here. I also knew going into this trade that I wanted to manage this one rather aggressively since AMD isn't a company I want to add to my portfolio. This put option generated net profits of $32.91. That might not seem like much but with only $1,000 of capital securing the position that's a wonderful 3.29% return in just over 1 weeks time. That equates to an annualized yield of 272.1%. I was able to secure 53% of the maximum profit in 20% of the days until expiration. I didn't think this trade through thoroughly enough when I went to close the position. It had been giving me fits for pretty much the life of the trade; however, that was because I didn't realize the mechanics of it. With many option positions the profit opens up earlier in the cycle if things work out; however, that's not the case with neutral positions right around the money, i.e. the iron fly. Frankly I closed this position a little too early given the mechanics of the trade. Especially since there wasn't a whole lot of room for implied volatility to come down to help unlock profits. If I had waited until this past Friday to close the position I could have realized a profit around $50 instead of just the $10 that occurred. Of course hindsight is 20/20, but going forward this is something I'll definitely remember with positions that are similar to the iron fly. This trade generated net profits of $9.84. Since there was $203.58 in capital at risk on the position that's a 5% return on capital. I was only able to capture 5% of the maximum profit in 70% of the days until expiration. Since the premium received on this trade wasn't exactly the largest I had planned on just riding this one out until expiration. Although sometimes the market works with you and it just didn't make much sense to keep the position on any more especially since I wanted to free up some capital for any other opportunities that arose. This put option generated net profits of $23.91. With $3,700 in capital securing the contract that's a 0.65% return. The equivalent annualized return is a solid 34.2%. I was able to secure 51% of the maximum profit potential in 19% of the days until expiration. My intention wasn't to take this position off after just 2 days, but if Mr. Market gives you the chance I've found out that you take it. I probably could have waited a bit longer to squeeze a little more juice of this, but I decided it was best to close it out, take my profits and look for other opportunities. This spread generated net profits of $7.42. With only $72.29 of capital at risk on the trade that's a solid 10% return on capital in just 2 days. 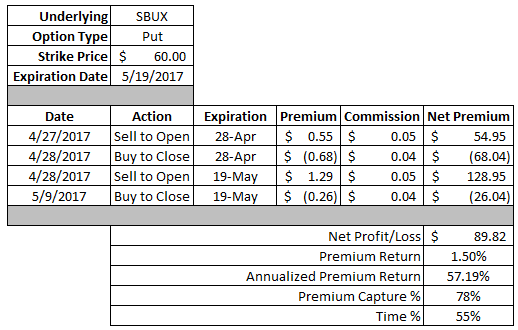 I was able to capture 27% of the maximum profit potential in just 5% of the days until expiration. 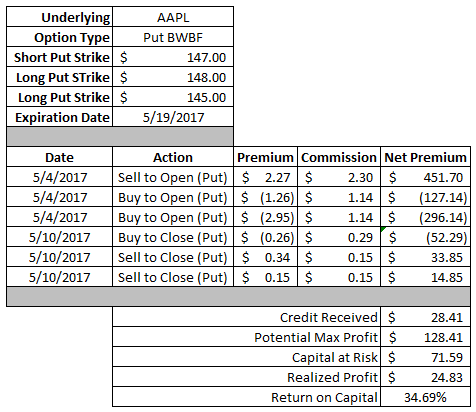 Ideally Apple's share price would have drifted down to the $147 short put's strike, but that wasn't exactly what happened. After putting this position on Apple's share price took off much higher and is now sitting over $156. I could have waited to just let this position expire OTM, but I decided to lock in some profits here. What I like about the put broken wing butterfly's is that if done for a credit you have no risk to the upside. So I was at a point where I had essentially maxed out my profit potential given where Apple was sitting and the only way I could have made more of the max potential profit was if Apple's share price declined between $8-9 per share in about a weeks time. That certainly could have happened, but I figured it made more sense to just close it out. This trade generated net profits of $24.83. With $71.59 of capital at risk on this position that's a solid 34.7% return on capital. I've mentioned a couple times that options allow you to reduce your basis with the option premium that you collect. My position is Nike is a great example of that. I purchased shares back in March for $58.42 per share had I just held onto the shares I'd still own 100 shares of Nike at $58.42 per share. However with options my basis is much lower. Since purchasing the shares I've written 3 covered call options against the shares collecting premium along the way. 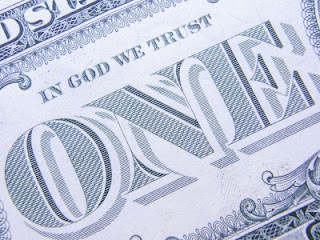 In total I've collected $146.77 in covered call premium. 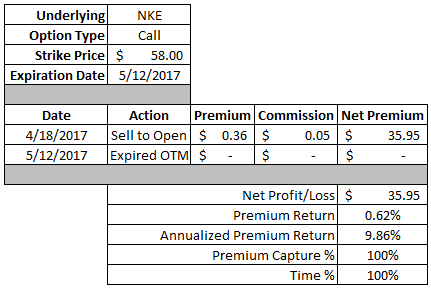 So I effectively own my shares of Nike at $56.95 or 2.5% cheaper than if I had just bought the shares and held them. This covered call generated net profits of $35.95. 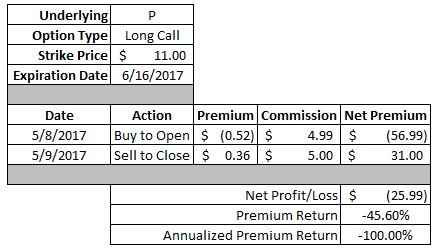 Based on the $58 strike of the call option that's a 0.62% return. Over the life of the position that's equivalent to a 9.9% annualized return. Another way to think of this is that I was essentially able to generate almost 2 extra dividend payments from Nike in just one month. This was one of my more boneheaded plays and I let emotion get in the way of sound reasoning. You see rumors had been circling that Pandora would potentially be acquired or merge with an as yet unannounced suitor and I let that cloud my judgement. All in all I can't be too upset since it was only a $26 loss, but it's definitely something I'm going to be mindful of when it comes to taking long shot bets that could potentially have a big payoff. This trade gave net losses of $25.99. Yikes! That's a 45.6% loss. As I delve deeper into the world of options there's definitely lessons being learned along the way. Most of all is patience, but that can be said for me with a lot of things. The other is how useful some brokerages are for setting up positions compared to others. With my current Rollover IRA brokerage firm I'm not allowed to do put ratio spreads even as cash secured. However, I can do it in two trades by selling the two put options in one order and buying the long put in a separate order. This puts on the same position, but makes it exponentially harder to put the position on as well as take the position off. Even though it's the exact same trade the simple fact that you can't do it in one move just adds an unnecessary degree of difficulty. Going forward though I've found a way around this by doing a broken wing butterfly, but instead of buying the long option that protects the downside close to where my short strike is I'll just go out much further away and buy a really cheap option. I'll have to give up a little bit of profit potential since I have to buy that contract, but considering how much easier it will be to do everything in one trade it's the best move. This trade produced net losses of $51.28. With $10,863.13 in capital at risk on this trade, the price I would have had to purchase shares of Disney, that works out to a -0.47% return. In hindsight I really needed to practice more patience with this position. Disney's shares sold off the morning after earnings were released which put this position to the test. However, I should have just let things play out and hope to get a bit of a rebound in the share price as well as the post earnings volatility crush to do its thing to make the options cheaper. Lesson learned. I probably shouldn't have put this trade on, but I wanted to try and get back some of the money I lost on the put ratio spread earnings play. Fortunately I was successful with this and was able to cut my overall loss by 40% in just a few hours. This option play generated net profits of $19.91. With $10,800 of capital at risk on this trade that's a 0.18% return. I was able to capture 36% of the maximum profit in just a few hours long holding period. Through the first two trading weeks of May I've already surpassed $1,000 in profits which is fun to see especially since the majority of the positions are either defined risk or cash secured so I can't be quite as efficient with my capital as I would like to be. Thus far in May I've generated net profits of $1,075.17 and year to date my net profits are $7,213.71. How do your readers respond to the option spread plays? 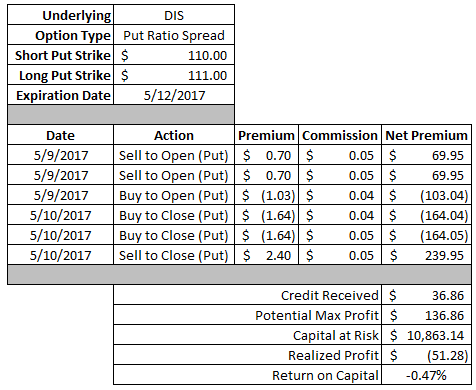 I've been blogging and trading just simple covered puts/calls for a couple years now but have considered adding some calendar spreads to the mix. Honestly I'd prefer to do just plain old covered calls/puts but the capital requirements are a bit high since the majority of my option trades are in IRA accounts. I'm thinking of replicating margin by buying protective wings just to release some of the capital. Of course then I have to pay a lot more attention to the actual capital at risk since I wouldn't treat them as spreads if they end up ITM. I haven't traded any calendars yet but I'm thinking of throwing a couple in just to see how it plays out. Great update. It looks like you supplemented your income well with these trade. 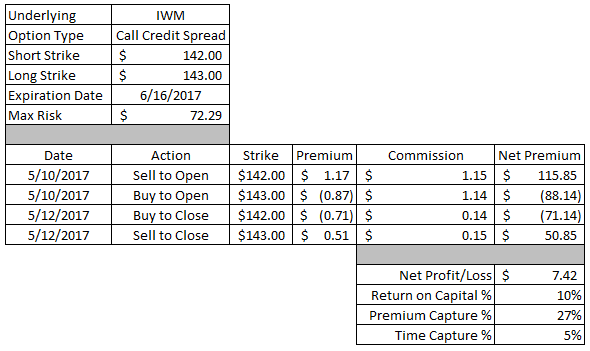 The last 1.5 months or so have been really great for generating options income. I hope to keep that momentum moving forward.